Measurements with persons are those in which human perception and interpretation are used for measuring complex, holistic quantities and qualities, which are perceived by the human brain and mind. Providing means for reproducible measurement of parameters such as pleasure and pain has important implications in evaluating all kind of products, services, and conditions. This book inaugurates a new era for this subject: a multi- and inter-disciplinary volume in which world-renowned scientists from the psychological, physical, biological, and social sciences reach a common understanding of measurement theory and methods. 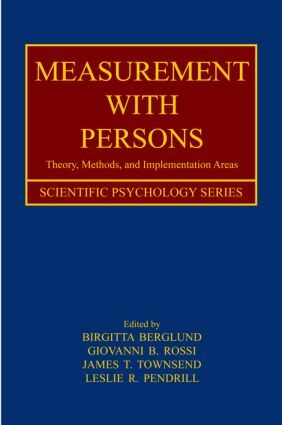 Measurement with Persons will appeal to a wide audience across a range of sciences, including general psychology and psychophysics, measurement theory, metrology and instrumentation, neurophysiology, engineering, biology, and chemistry. "Birgitta Berglund and Giovanni Battista Rossi, two distinguished and active scientists in the field, have brought together in this volume a set of valuable papers by experts. It is a most welcome contribution to an important area of measurement science." "This collection of 16 chapters on human measurement topics follows the 20th Century tradition of Handbooks except for being uniquely international in scope. It appears to stem from the annual meeting of the International Society for Psychophysics. Of course, brain imaging is a substantial presence." Part 1. Theory and Methods. B. Berglund, G.B. Rossi, A. Wallard, Measurement Across Physical and Behavioural Sciences. B. Berglund, Measurement in Psychology. T. Goodman, Measurement of Physical Parameters in Sensory Science. F.S. Roberts, Meaningful and Meaningless Statements in Epidemiology and Public Health. G.B. Rossi, Towards a Probabilistic Theory of Measurement. G.W.A.M. van der Heijden, R. Emardson, Multivariate Measurements. J.T. Townsend, D. Burns, L. Pei, The Prospects for Measurement in Infinite Dimensional Psychological Spaces. S. Link, Psychophysical Linguistics. E.N. Dzhafarov, Mathematical Foundations of Universal Fechnerian Scaling. C. Eitzinger, W. Heidl, Neural Networks and Fuzzy Systems. Part 2. Implementation Areas. P. Susini, G. Lemaitre, S. McAdams, Psychological Measurement for Sound Description and Evaluation. R. Hölzl, D. Kleinböhl, J. Trojan, Nociception and Pain in Thermal Skin Sensitivity. B.M. Velichkovsky et al., Measurement-related Issues in the Investigation of Active Vision. P.A. Della Rosa, D. Perani, Electrical and Functional Brain Imaging. C.B.A. Sinke, M.E. Kret, B. de Gelder, Body Language: Embodied Perception of Emotions. L. Pendrill, Risk Assessment and Decision-making.